Weaving that last shawl was fun! While I was busily throwing the shuttle during the first I wondered what it would look like if I reversed the treadling? So I took a look at this reversal on the draft in my PCW Fiberworks program and it looked good. So I played around with the colours and stripe arrangement. I could see areas that I could improve or expand. I decided to reverse colours as well.... to use a lighter shade. Remember, I'm trying to explore more colour in my weaving too. Same 12 shaft M's and W's threading as before, same 8/2 tencel... even the tie up is all ready done! So the colours here are eggplant, orchid and a green and also a variegated tencel in shades of plum pinks, blues, greens and turquoise. All colours to be found in the northern lights or aurora borealis. Since we recently had a major solar flare and increase of northern light activity, it seemed to be timely. I found the "ABBA Gold Hits" collection great twisting music with a side of sing a long! It also took an afternoon as I had to work out the various groupings. Time to put some of those new bead treasures to work. The eggplant colour is actually hard to match up and so my selection is rather small. I also found it looked different in different lights too. I had a halogen, an Ott lamp and good bright daylight and it looked different in each ... and so did the beads! Needless to say, it took some work to resolve. Next step step was handwashing as like the previous shawl, with hanging to dry over night, and then a hard pressing with my steam iron. Madge was called up for duty again. Both Aurora and Little Lochmaben are going to the Retreat next weekend with me and I'll report back how they do. Its going to be a girl bonding weekend just me and Lynnette... and probably a 100+/- others! Now that the baby shower is over and we are waiting on little M.E to make their mid April debut, it's back to the other events on the calendar. So another deadline looms for me (literally and figuratively!) The Retreat is coming up at the months end: March 30, 31 and April 1. There is a bag exchange, an exhibit and a fashion show during the banquet on Saturday night. I'm weaving for the fashion show! I plan on taking two shawls and I have one ready to go. The second is coming to a fast finish soon! Once off the loom, I evened up the fringe allowance and pinned it out on the board and then got to work! I decided to twist the band fringe first and so had to get creative with the colour arrangement. The solid turquoise sections went quickly using the four clip Leclerc twister. The smoothest twister to use is still the Forsyth model though. Once that task was complete (with the trip and the baby shower as a break between ends), it was laid to soak in the laundry tub. I squeezed the shawl thoroughly to help shift the threads into their positions, rinsed it and rinsed once more with a drop of scent free liquid fabric softener in the water. I spun it out in the washing machine and then hung to dry on a pvc rod suspended from the ceiling overnight. I pressed it hard using steam and the transformation from bumpy texture to ultra smooth and silky always amazes me each time I reach this step of finishing a project. Its the reward for all the work! I used a rotary cutter and mat to trim the tassel ends neatly. Its hard to see in my photos, but there is a lovely iridescence. Usually this appears when there is more plain weave involved, but its there with the twill! Okay, fair warning.... this post will run a little long! Its the whole deal from the project start to the final gifting so it will be worth the wait for all the reading! I told you all in a previous post that we are about to become first time grandparents in mid April and so I had to fire up the loom and get busy! I'm going to be explaining each step as my son and daughter in law will be reading and learning what was involved with the making of their gifts. First up, after planning the project math out on paper and playing with the design in my computer program, I wind the warp that will go on the loom. In this case, 826 warp ends that will be sett at 24 ends in every inch, and be 35" wide on the loom. The length of the warp is just under 8 yards. I'm using 8/2 white cotton. Next up, I take the individual sections and load them onto long smooth sticks which are then supported by cords from the upper portions of the loom. It means the threads are now accessible from the front of the loom. 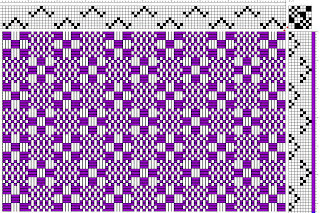 I reach through and thread the heddles in the given sequence needed for the project. Each thread goes through one of the white heddles.... all 826 of them! I don't rush this part as going back in to fix mistakes is tedious so I put on some good music and take my time. Here's the view from behind showing the the support sticks in place....each thread in order as it was wound. This is the widest project I have done in some time! It looked neat to have the loom nearly full width wise. All done! I have thrown some shots of scrap yarn to close the gaps and even tried a new technique of looping a thread over the end of the apron rod. It did help to prevent curling of the edges until they were over the breast beam! I had to adjust my 'heft' of throwing the shuttle to the new width when weaving as it is far wider than my scarves, towels or even shawls. I could feel it in my arms the next day! I wove up the hem allowance and then hemstitched on the loom. First blanket is white on white and the weft yarn is unusual in that it is Aunt Lydia's crochet cotton, 100 yard jumbo cone from Wally World. I like the corded look and the great shine it has for 100 % mercerised cotton. It will take all the machine washing to come! I had help. I would get so focused on the task at hand that apparently I *needed* to stop and have fun occasionally! Calli would lie beside the loom and with her paw, punch the toy in under the treadles....then sit like this and stare at me doing her version of doggy mind reading until I got the hint! 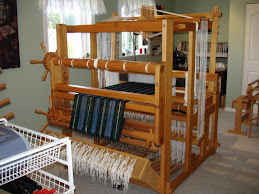 I used a temple or stretcher to keep the warp at the given width and so this meant moving it every two blocks of the pattern woven or every 18-20 throws. I wove the crib blankets to 65" each plus hems. Besides the white, there was also a beige version using the Aunt Lydia's crochet cotton in a soft beige....with white hems. The last one was woven in a fresh green using a 60/40 cottolin (which is a blend of linen and cotton) and again, white hems. The baby shower was this past Sunday and the decorating started at 9 am with balloons and streamers. The food preparation was well under way by noon. I was a helper with Lisa's mother, Adele, and Adele's sister known to all as Auntie Zia. There was many friends and family there and all came bearing gifts and big smiles. Everyone loves babies! When the gift opening started, I stood at the back and took pictures... and by day's end I had over 200. Here's daughter in law Lisa, with her friend Lisa (who organized the shower) and Lisa is opening up one of our gifts....a Baby book to record all those special firsts. I had just given my son his Baby book with all his pictures and mementos so it seemed appropriate to start the wee one off right too. The new format for the books nowadays is with stickers and such to have fun recording the events. Turns out my daughter in law is a scrapbooker and when she opened it up she was so happy to see it, her toes curled! We also gave small items such as baby spoons, slippers, natural baby products for bath time... and the blankets. We're looking forward to seeing it again, with a baby in it, later this summer at our house! Then there was the food... and an Italian cake with pastry on the bottom and filled with cream and custard. Yummy! It was a long day but fun and it was great to meet so many of their friends. Later once everyone had gone and it was just family and the men folk had come back from their afternoon at the movies, Adele made spaghetti and we sat and chatted. I sure slept like a log that night! I had taken along some long sharp scissors with me to snip off the little rosebuds from the blankets once they had served their purpose for the shower. The rosebuds are destined to be included in a future scrapbook project. I took the liberty of draping the blankets on the crib to see what they look like. They fit well width wise and a bit overlong for the crib length, but oh well! Next ones will be woven to 55" or 60" Better too long than too short! So, I'm off to rest and recover! That was a lot of talking and fun and its tuckered me out. Don't worry... I'm weaving! In between laundry loads I'm getting busy with the shawls for the Retreat later this month. Oh, and the M.E ? That's the first initials of the chosen baby names both for a boy or a girl. Those will be revealed in time and that won't be very long!